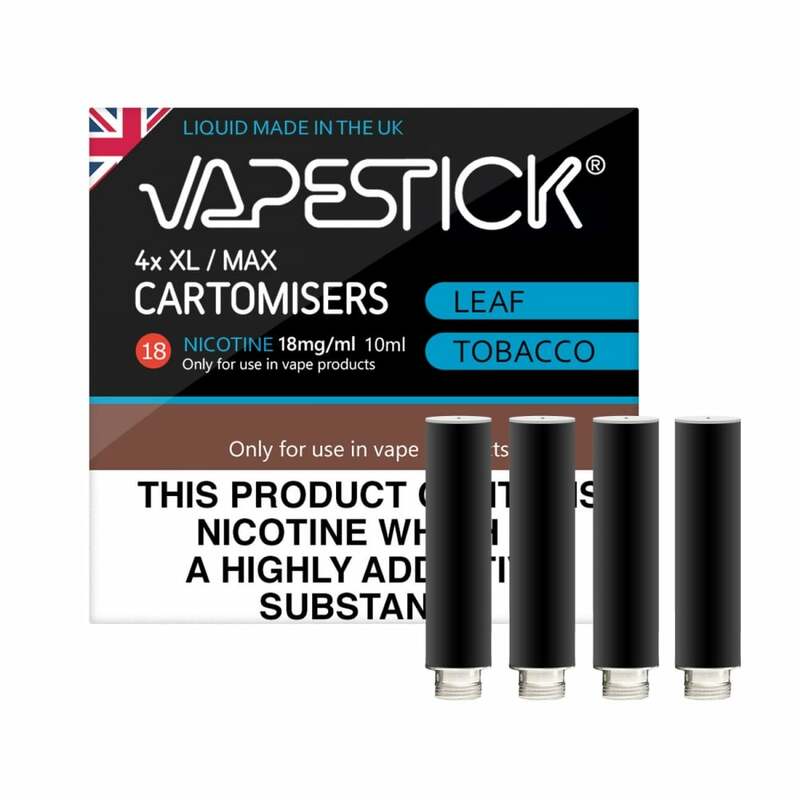 Now known as "Leaf Tobacco"
Vapestick Cartomizer Refills are designed to work with Vapestick XL E-Cigarette Starter Kits and stocking up on refills ensures you’re never short of your favourite flavour. Easy to fit and simply designed, the traditional cig-a-like style of the Vapestick XL makes it popular with both brand new and experienced vapers. Easily move from traditional cigarettes or your own rollups to vaping with the authentic and rich flavour of Rolling Tobacco Cartomizers by the Vapestick brand. Rolling tobacco has become a very popular flavour and companies like Vapestick have worked to nail down authenticity and a truly believable replica in their cartomizers, with all the quality of premium rolling tobacco brands like Golden Virginia. You can enjoy your four-pack of cartomizer refills in 24mg, 18mg or 11mg nicotine strength to suit your personal preference. Great cartridges. Just screw them in and go. No mess, no liquid on your lips, decent flavour. I would say as a smoking experience, the cartomisers are probabaly the best on the market. Unfortunately they have stopped selling the maxi battery, and the smaller batteries they supply are useless. This is a realistic and good product. My only concern is the cartomisers vape time which is slightly poor. Ancillery Max batteries are non existent for this catomiser, so the product lacks the back up from the manafacturer. Stength was 18 mg not 24 mg and although tasted ok cartomizers didnt last long as my regular supplier, so not overly impressed. I love the fact that I can bultimate buy my cartomisers. I also appreciate how quickey I can order and how quickly they arrive at my door. Best I've used. Like the taste & ease of use. Have ordered these over the last few years, very good my husband can recommend them. Good taste. Not sure yet about the capacity, may be I can review it later. My husband has been using these to help stop smoking. Works brilliantly. After over fourty years of heavy smoking his cough went within days and he feels so much better. Always fantastic and speedy service, together with a great price for my refills what more could you ask! First class. I was told Vapestick had changed their supplier for their prefilled cartomizers. The taste is awful compared to the cartomizers that came with the vapestick. Why change what for me was a great product to begin with. if its not broke, don't fix it. Really disappointed.